Enjoy 100 feet of beach, a private boat slip and tons of outdoor seating. 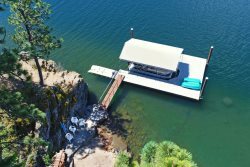 Rockford Bay Retreat is one of our Signature Series homes located in secluded Rockford Bay on Lake Coeur d’Alene. This quiet hideaway sets the ideal backdrop to relax and recharge surrounded by nature, yet is only a 25 minute drive—and an even shorter boat ride—to downtown Coeur d’Alene’s shopping, dining, entertainment, public beaches, and parks. The drive to Rockford Bay is full of wildlife, beautiful trees and other Northwest scenery. You can easily zip around all over the lake by boat from this fantastic waterfront cabin, including to minutes away local favorite Shooters Bar & Grill. Serving delicious food and drinks on their beautiful patio, this family-friendly restaurant is appropriate for a variety of groups. The outdoor area of this home is absolutely incredible and offers numerous options to relax or play. Lush green grass goes all the way down to the water and the 100 foot beach’s south facing position allows you to enjoy the sun all day. Tons of tables and chairs circulate on the two massive decks that are ideal for enjoying lake and forest views from sunrise to sunset. You’ll also love sight seeing while you grill on the deck’s BBQ. The front of the home offers even more seating, an outdoor fireplace, and a stunning rustic chandelier. Head down to the private dock and enjoy a few more seats and one boat slip for your use. It’s not guaranteed, but you may have complimentary access to a boat and/or kayak, but please refrain from using the sailboat in the other slip. Inside the home you’ll enjoy 3 bedrooms and 3 full bathrooms. Two of the bedrooms have queen beds—one with deck access—and the other has a full bed. Two of the bathrooms offer shower/tub combos and the third is equipped with a standing shower. Indoors, ample comfortable seating provides plenty of areas to enjoy the lake through the spacious windows. You can access the deck from the living room and the entertainment room has a TV and a fireplace to curl up next to in the evenings. The fully stocked kitchen is complete with granite counters, plus a granite island for extra meal prep space and seating for 2. The adjacent dining area has fantastic lake views and a wooden table with seating for 6. Indoors, outdoors or boating around, this waterfront cabin is ideal for your family’s lakefront adventure. Had an issue with bees and Marissa was right on it. Very responsive. Most noticeable was how CLEAN the place was when we checked in. This was our 5th yr at this place, and it's never before been so immaculate! We've rented here 5 years in a row. That speaks to how pleased with the property and its location! The VRA team are outstanding.